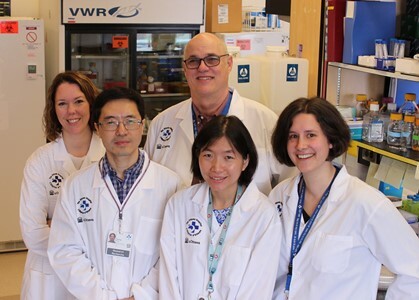 Researchers at The Ottawa Hospital and the University of Ottawa have discovered a completely new function for the protein complex containing the dystrophin protein, which is missing in people with Duchenne muscular dystrophy. Dr. Michael Rudnicki and his team found this complex brings two other proteins called p38gamma and Carm1 together in muscle stem cells, and this interaction establishes a genetic program that ultimately produces new muscle fibres. In laboratory models of Duchenne muscular dystrophy, this interaction never happens, so any new muscle fibres have a faulty genetic program. The new discovery is published in Cell Stem Cell. It builds on Dr. Rudnicki’s landmark discovery in 2015 showing that Duchenne muscular dystrophy directly affects muscle stem cells. “This research represents a profound new insight into Duchenne muscular dystrophy and brings us another step closer to developing new treatments for this devastating disease,” said Dr. Rudnicki. Duchenne muscular dystrophy is the most common form of muscular dystrophy, affecting approximately one in 3,600 boys. It weakens the muscles and causes death by the second or third decade of life. Authors: Natasha C. Chang, Marie-Claude Sincennes, Fabien P. Chevalier, Caroline E. Brun, Melanie Lacaria, Jessica Segalés, Pura Muñoz-Cánovez, Hong Ming, Michael A. Rudnicki. Acknowledgements: Dr. Rudnicki is a senior scientist and Director of the Regenerative Medicine Program and the Sprott Centre for Stem Cell Research at The Ottawa Hospital. He is also a professor at the University of Ottawa, Scientific Director of the Stem Cell Network and Canada Research Chair in Molecular Genetics. Dr. Rudnicki’s research is supported by generous donors to Regenerative Medicine at The Ottawa Hospital. This study was also supported by the U.S. National Institutes for Health, the Canadian Institutes of Health Research, the Muscular Dystrophy Association, Muscular Dystrophy Canada, the Stem Cell Network, the University of Ottawa Brain and Mind Research Institute, the Ontario Institute for Regenerative Medicine and the French Muscular Dystrophy Association.